The Heilerde-Gesellschaft Luvos Just GmbH & Co. KG was founded by Adolf Just in Blankenburg in 1918. Very soon, "Adolf Justs Luvos Heilerde" had become a natural medicine that was held in high esteem both at home and abroad. The consequences of WWII required a stop of manufacture. After WWII, the Heilerde-Gesellschaft moved to Bad Homburg in Hesse and later to neighbouring Friedrichsdorf, where it has its seat still today. "Let‘s turn back to the gifts of nature and use them for our well-being!" This was Adolf Just‘s life-long motto. He therefore considered it particularly important to use as medicine only purely natural products without any chemical or other additives. In more than 90 years of manufacturing and distributing pharmaceutical and medical products, the founder’s atttude has become an unalterable part of the company‘s tradition. Up to this day, the Heilerde-Gesellschaft has continued to be the leading German company to produce and distribute natural medical and cosmetic products from Luvos healing earth. Adolf Just dismantled glacial loess in Derenburg for his Luvos Healing Earth, which was then dried, processed and packed in Blankenburg. Due to the influences of the war production had to be interrupted. After World War II, the Healing Earth Society was first rebuilt in Bad Homburg in Hesse by Otto Köhler, son-in-law of Adolf Just. It is thanks to his tireless efforts that the Healing Earth Society later moved into a modern production facility in neighboring Friedrichsdorf. 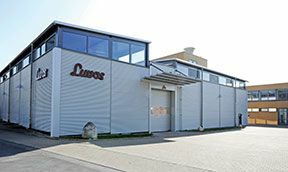 There, the family-owned company with its now almost 100-year-old tradition still resides today and successfully produces Luvos Healing Earth by highest pharmaceutical quality criteria. Particularly important was Adolf Just, a pure natural product without chemical or other additives to use as a remedy. According to this philosophy, the family business still produces Luvos Healing Earth.